June is one of our favourite months of the year, being one of the sunniest months of the year, it’s the ideal time to visit the Scottish Borders, it’s also the month for three of our best-loved Borders events. The Scottish Borders Historic Motoring Extravaganza, the Borders Book Festival and the Melrose Festival. The Scottish Borders Historic Motoring Extravaganza is now in its 45th year and is arguably the best classic car festival in Scotland. This year the event is celebrating the history of the Great British Sports Car and it’s estimated that over 1,000 cars are due to attend, including some fantastic British sports cars. The event takes place on the 4th of June at the historical Thirlestane Castle in nearby Lauder. As well as the array of classic cars, there is a craft and gift fair, steel band, dance troupe, gun dog display and a fun fair for the kids along with face painting and lots of other activities to keep the children happy. Under 16’s go free and tickets are only £10 for adults at the gate, but if you book in advance via the box office they are only £8. Over 7,000 attend this unique event making it one of the biggest in the Scottish Borders and it’s truly a great day out. Keep up-to-date with the cars attending and all information about the day itself on their Facebook page. 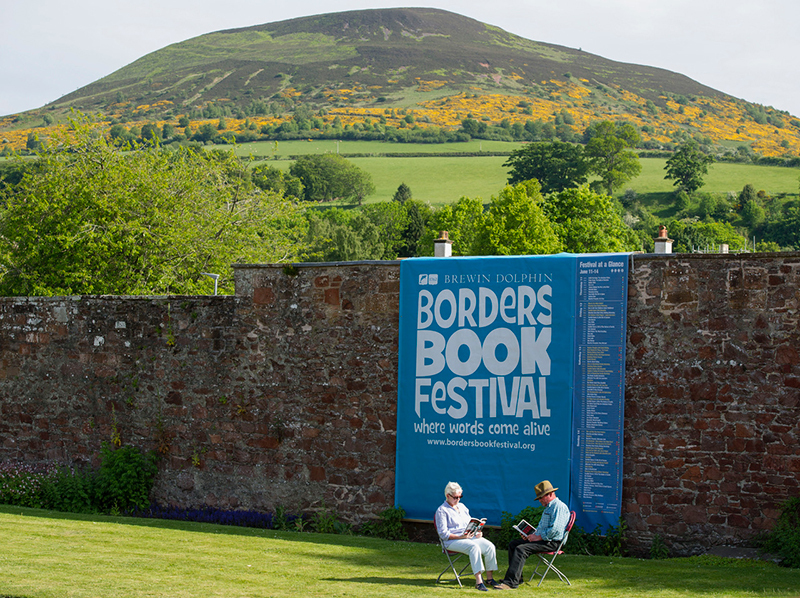 From the 15-18 June, Melrose welcomes the annual Borders Book Festival which this year is said to be “the biggest, best and most diverse yet.” Highlights include celebrities John Cleese, Sir Michael Parkinson, Melvyn Bragg, Anne Reid and Judy Murray. The coveted Sir Walter Scott prize will be announced on the Saturday with 6 fantastic historical fiction authors in the running. Politically, James Naughtie will be discussing all things Trump, while Michael Moore and Douglas Alexander will reflect on the recent UK election on the 8th June. Fiction readers have lots of authors to choose from with Joanne Trollope, Val McDermid and Ann Cleeves of Vera and Shetland fame to name just a few. Finally, the acclaimed plantswoman and regular presenter of BBC Gardeners’ World, Carol Klein will be discussing her own cottage garden on the Sunday and Jay Rayner, MasterChef judge and restaurant critic, feeds us his Ten Food Commandments on the Saturday, so there really is something for everyone. Children are also well catered for over the weekend with a variety of their favourite children’s authors and a chance to meet TV’s most exciting adventurer, explorer and wildlife expert Steve Backshall! Tickets are available on The Border Book Festival website. Both Burts and the Townhouse will be open for meals during the festival, but please book early to avoid disappointment, as we do tend to get booked up. Finally, Melrose Festival week takes place from the 18th-24th of June. The Melrose Festival was instituted in 1938 to commemorate the town’s history, with the ‘Melrosian’ as the central figure. Key events during the week are the Melrosian’s Rideout which takes place on the Monday night visiting Dingleton, Newstead and Gattonside, the famous fancy dress parade on the Tuesday night and the crowning of the Melrose Festival Queen at Melrose Abbey on the Thursday. The Melrose Festival Ball takes place on the Friday night and then we round of the week’s celebrations on the Saturday with the Melrose District Pipes and Drums in the square outside Burts and the Townhouse at 7pm. For more information see the Return to the Ridings website. The Scottish Borders is a great place to visit at any time of the year but June is an extra special month. Why not book your stay at Burts or the Townhouse and experience the magic of these diverse events for yourself.